Apple has a rich history of bold risks and controversial decisions that ultimately paid off, though there have been equally numerous instances where the Cupertino giant seemed to drop the ball. The latest example of the latter would have to be the nixing of a particularly useful part of the iOS multitasking experience. With the introduction of iOS 10, those who plumped for an iPhone 6s, 6s Plus, or the new iPhone 7 duo enjoyed the convenience of a new app switching gesture that made use of the devices’ 3D Touch capability. 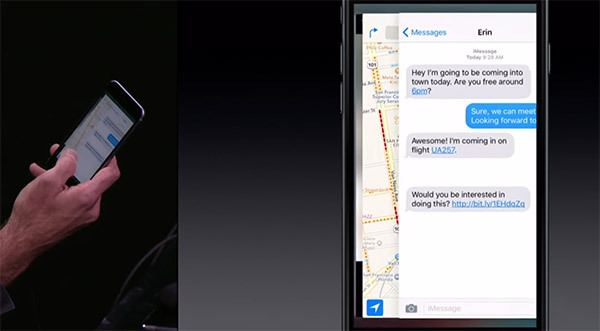 The gesture allows users to press down hard at the left edge of the screen to jump into the app switcher or continue dragging across to quickly switch to the next app in the switcher. In scenarios where one would have to repeatedly switch back and forth between two apps, the latter, in particular, would be the faster option compared to launching the app switcher with a double click on the Home button and thumbing through its app previews. If you, like us, have grown attached to this little feature, you might want to prepare yourself to part with it soon. 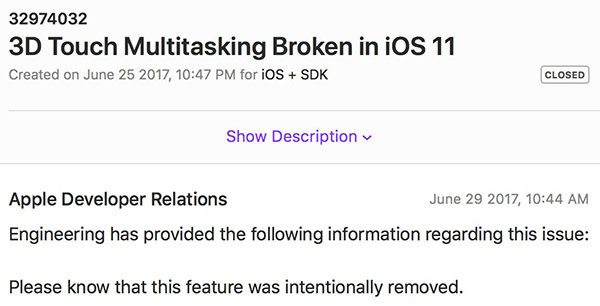 On discovering the absence of the aforementioned gesture in a beta build of iOS 11, Twitter user Bryan Irace filed a Radar for what he assumed was a bug, only to have Apple engineering confirm that the removal of the feature was intentional. While the decision might not warrant the kind of controversy that followed the removal of the headphone jack from the iPhone, it is bound to ruffle some feathers. The feature is clearly useful, and if anything, an option to toggle it on or off might have been more acceptable to most than having it completely axed. That said, knowing how seriously Apple takes its design and UX decisions, this one was likely made after careful consideration of usage statistics and feedback from countless sources. Again, though, that might not matter to those who’ve grown used to the gesture. It was probably removed due to something to do with the hardware of the next iPhone (iPhone 8) as if it’s got an edge to edge screen they’ve probably got some plans for the side bits. I could never use the feature properly. U have to put too much force too accurately to initiate the gesture. And if u have a temepered glass or any other hard screen protector its almost impossible. It was useful, but not that big of a deal. I’d end up swiping back on web pages instead of switching apps like I wanted. Same here. Such a shame too cause it was a great feature just not very usuable. I remember there was a jailbreak tweak called Zephyr back I think during like iOS 7 and 8 that did the same thing but without the pressure (like the iPad had) and I used it quite often. That was very useful. So happy I won’t be updating… I use it 50 times a day at least. Much better than putting wear on the home button. I tend to agree this more likely as a result of new hardware/software features on the next iPhone, than it is to do with messing with the UX. Plus the remark on the Radar could suggest that it’s been pulled whilst they develop something in the background and it might reappear in a future beta.